Our fabrics are bursting with COLOR! Sugarfoots is a privately owned company committed to helping young people of all ages grow and mature through various artistic mediums that celebrate culture and diversity. 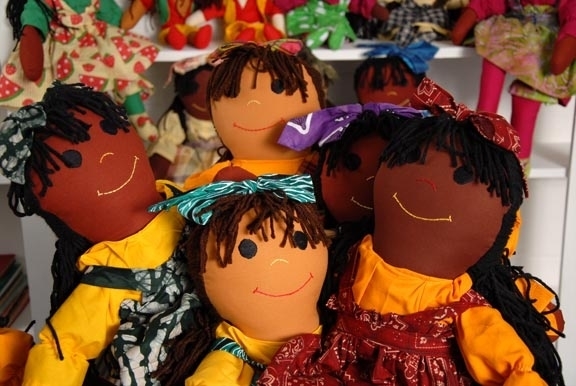 Our anchor product is a renowned child-safe, multi-ethnic rag doll, handcrafted in three natural shades; cocoa, ginger, and cinnamon. We are complemented by a children’s book series based on folktales from cultures around the world. Our mission is sustained by a performing arts summer camp for youth that sets the pace among competitors, inspiriting the imagination through creative storytelling, song and dance. "CeLEBRATING DIVERSITY ONE FOOT AT A TIME." Sugarfoots Tattle-Tales Series is adapted from folktales from around the world. During our annual performing arts summer camp program, the book series is adapted into a stage production with a dinner theatre performance that is open to the community. Barbara El Wilson who is based in Washington, DC has traveled throughout the United States and abroad and has gathered a plethora of stories delighting audiences wherever she goes. She is available to perform at birthday parties/school assemblies, give acting lessons, and host theatre workshops.